In 2016, Pharmanova sold an average of 1,400 kits of co-packaged ORS/Zinc per working day. 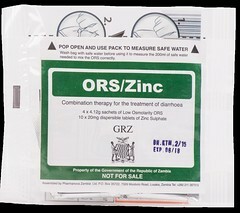 This is a remarkable achievement in a country where, in 2013, 99% of diarrhoea cases were not treated with ORS and Zinc in common with the other countries in sub-Saharan Africa. The trial version of the kit that fitted in Coca-Cola crates. Discontinued from Oct-16. 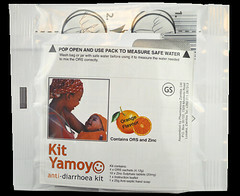 Introduced in Oct-15 as the primary scale-up version of Kit Yamoyo. Introduced in Oct-16 after the ZRA ruling on VAT. Supplied to Medical Stores Limited from Sep-15 to Dec-16 for distribution to public health centres in the Scaling Up Nutrition (SUN) Districts. Given away free. 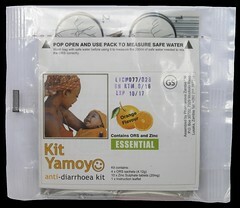 This co-pack is the same as the Kit Yamoyo ESSENTIAL format except that it is branded differently by including a different leaflet. The Pharmanova factory works 5.5 days per week and there were 15 Public Holidays in 2016 giving 271 working days in the year ((52 x 5.5) – 15) which means an average of 1,400 kits left the factory every working day. The striking thing about these figures is that 93% of the production went into the public sector and are being given away free in selected districts (was 11 districts, now it’s 14) where malnutrition is a particular problem. But aren’t we supposed to developing the market for a commercial product? We see the private sector, and the commercial versions of Kit Yamoyo, as the foundation of our work. This is how our work will become self-sustaining. Without the private sector products in place, the Ministry of Health would have had nowhere to buy a public sector version of the kit. Furthermore, we know that one cannot build a business on the basis of the occasional huge order from the public sector. A spin-off of receiving this large order from the Ministry of Health was that Pharmanova was able to reduce their gross margins across all formats which made the ex-factory price of the commercial formats cheaper than they would otherwise have been.